Radioactive particles of uranium, thorium, radium, cesium, strontium, polonium, tellurium and americium are still afloat throughout Northern Japan more than six years after a tsunami slammed into the Fukushima Daiichi Power Plant causing three full-blown nuclear meltdowns. That was the conclusion reached by two of the world’s leading radiation experts after conducting an extensive five-year monitoring project. The purposes of the study were to identify and collect samples with a high potential to contain radioactively-hot particles for microscopic examination, to determine if local hot spots of contamination existed at the time of the Fukushima Dai-ichi meltdowns, and finally to document whether any hot spots persisted five years after the accidents. Samples of 180 Japanese house dusts, car engine filters, HVAC filters, street dusts and fine surface soils were collected and shipped to Worcester Polytechnic Institute for radioisotope analysis. A total of 235 US and Canadian samples of similar matrices were collected between 2011 and 2015. Of these 180 Japanese particulate matter samples, 57 were automobile or home air filters, 59 were surface dust samples, 29 were street dusts (accumulated surface soils and dusts) and 33 were vacuum cleaner bag or other dust samples. All filters were in service on or after March 11, 2011, the date of the initial releases from the Fukushima Dai-ichi reactors. Of the 180 samples from Japan, 108 were collected in Japan during 2016 while the remaining 72 samples were collected during 2011. These samples included fine surface soils, sediments from drainage areas, and soils from floor mats. Dusts were collected from bulk and surface dust accumulations; including air handling fans, residential air filters, vacuum cleaner bags, automobile air filters, public restroom ventilation fans and from surfaces at public transportation points throughout northern Japan. This study used a mix of samples submitted by volunteers and by the authors. There were controls on the volunteers’ methods used to select samples, however direct sampling oversight was limited. Fifteen scientists and volunteer citizen-scientists collected these samples in areas across Japan, but predominantly in Fukushima Prefecture and Minamisoma City. Sampling locations were in publicly-accessible areas such as bike paths, roadways, sidewalks and public buildings. 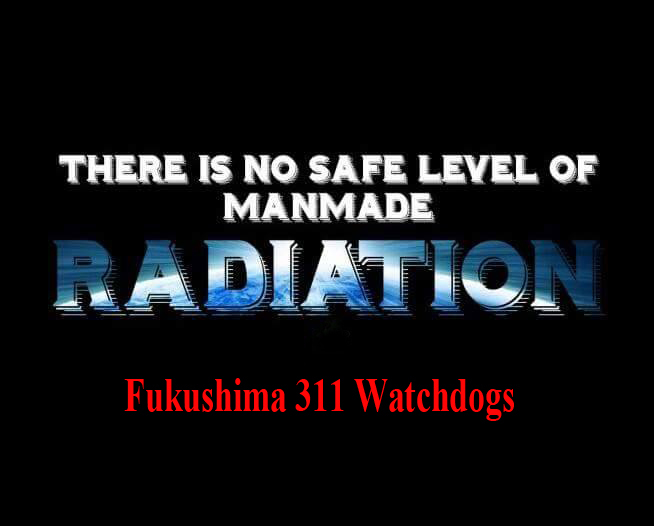 Permits were received to sample in restricted areas where post-Fukushima meltdown decontamination work was in progress. A majority of these samples were collected from locations in decontaminated zones cleared for habitation by the National Government of Japan. Sample collection was biased by performing a preliminary visual survey to facilitate collection from areas where fine particulate matter can accumulate, such as low spots on roads or rooftops, air handling fan blades, floor mats and rooftops. For the 2016 sample set (108 of 180 samples), an International Medcom Inspector Alert surface contamination monitor (radiation survey meter) was used to identify samples from within low lying areas and on contaminated outdoor surfaces. Screening introduces a bias to the soil sample set allowing for maximum probability of collecting particulate matter that might contain hot particles. Indoor dusts, HVAC system dusts and auto air filters were randomly selected and no survey meters were used nor were surface radiation measurements taken prior to dust sample collection. At the time of the 2016 sampling campaign, mapped surface activity data was available from Safecast, an open citizen-led group that collected activity data via a standardized device of their own design, the bGeigie. Uncontaminated areas in Japan (as mapped by safecast.org) have bGeigie-measured activities on the order of 0.08 uSv/hr. or less. Areas of known contamination are on the order of 0.16 uSv/hr. and higher. More than 90 percent of the samples in this study come from the areas Safecast-mapped as 0.16 uSv/hr. and higher (Figure 1). This indicates that the data are more representative of the contaminated zone, rather than of Japan as a whole. Mapping via the Safecast bGeigie proceeds with a plastic alpha and beta shield around the detector element. This makes the device essentially a gamma activity monitor. Thirteen of the 2016 samples from Japan were measured by the primary instrument (Ortec NaI well gamma photon detector) and the bGeigie. With the shield present on the bGeigie so that both devices measured gamma energy only, the R2 value between the two sets was 0.97, a good fit (Figure 2). Without the shield the bGeigie also accumulated beta and alpha energy, so the fit was poorer, with R2 = 0.15. The strong correlation between the bGeigie in gamma mode and the Ortec spectrometer is added evidence that the sampling methodology provides data that is more representative of the contaminated areas in northern Japan, and less so for Japan as a whole. For each 2016 sample collection location point, a photograph was taken to provide an image of where the sample was collected as well as a record of the GPS location. All Japanese samples were air dried at ambient temperature prior to analysis, then shipped internationally to Worcester Polytechnic Institute in Worcester, MA, USA, for analysis. Motor vehicle engine air filters process large volumes of air. In Japan private vehicles average 65 liters of gasoline use per month. (Schipper 2009) This fuel requires approximately 638 cubic meters of air for complete combustion. This is about 30 cubic meters per day, which is in the same order of magnitude as a working adult tidal air volume of 10 to 20 cubic meters per day. It was hypothesized that engine air filters in routine use and first installed prior to March 11, 2011 would provide an approximation of the amount of radioactive dusts present in ambient air for each driving region. Bulk dust and street dust/soil samples were air dried at ambient temperatures prior to analyses. Dust samples containing macroscopic objects and excessive pet hair were sieved to pass a 150 micron brass ASTM #100 screen. Samples were divided and separately screened by gamma spectroscopy to determine if activity was heterogeneously distributed within samples. Samples were sequentially divided if necessary, based on gamma-screening results. Dust was mechanically removed from automobile and HVAC filters. Motor vehicle air filters varied in usage from nearly new to as much as 55,000 logged kilometers of use. Sample results for dust samples were reported on a kBq kg-1 basis. Eight filter samples with detectable activities but with dust that could not be quantitatively removed from filter media were assigned a dust mass of 1.0 g. This introduced a low bias to these samples. Nine samples had activities greater than 0.25 MBq kg-1. To ensure safe transport, these samples were mass-limited to 3 grams before shipping from Japan. Included in this set of nine atypically-radioactive samples, was a 300 mg sample of street dust received from a location about 10 km from the Fukushima-Dai-ichi accident site in Namie-machi, Futaba-gun, Fukushima Prefecture. This is in the restricted zone, close to but just outside of the exclusion zone. A very similar sample was collected from Iitate. The particulate matter samples were analyzed by sodium iodide gamma spectrometry. One vacuum bag received from a home in Nagoya, Japan, yielded subsamples with no detectable radioactivity above background, despite a sizable amount of activity for the bag as a whole. (Nagoya is 433 km from Fukushima Dai-ichi). By sample division and hot particle isolation with a pancake detector, a single 1 cm by 2 cm glass slide was prepared, with a small number of microscopic dust particles (with activity > 1 MBq ug-1) mounted via double sided adhesive tape. Analyses of the samples proceeded sequentially by NaI gamma spectrometry, autoradiography of high activity samples, and scanning electron microscopy / energy dispersive X-ray analysis (SEM/EDS) of individual radioactively-hot particles identified by autoradiography (Moody 2015). Autoradiographs were prepared from the highest specific activity samples using blue-sensitive X-ray film, followed by SEM/EDS analysis of autoradiographically positive portions of the sample. Air filter media that had positive gamma spectrometry results were mounted in a single layer onto double sided adhesive paper sheets. These sheets with dusts were then attached to 3 mm thick copper plates. Vehicle and HVAC air filters were prepared by cutting the filter media from their frames, and mounting the filter media on 3 mm thick copper plates. A sheet of blue-sensitive Xray film was sandwiched with the mounted filters, and exposed in a dark photographer’s box for seven days. The autoradiographs used MidSci® classic blue autoradiography film BX and D76 processing. All gamma spectrometry data are corrected for geometry, and were standardized against a known activity of 137Cs. Gamma photon analyses used Ortec® NaI and Canberra® GeLi flat plate photon detectors. An Ortec® NaI well detector and 1K MCA were also used. Counting efficiency @ 662 keV was found to be 30% based on use of a certified calibration standard from an Eckert & Ziegler Isotope Products standard source, manufactured and certified on Sept. 12, 2011, with 40.12 nCi of 137Cs. The 137Cs in the standard used for quantitation and any Fukushima-related 137Cs in the samples were of the same approximate age, therefore no 137Cs decay correction is warranted in this five-year study. Nuclides not amenable to gamma spectrometry, such as strontium, were not analyzed in this study. Samples with evident gamma spectral peaks for uranium, thorium or plutonium were selected for SEM/EDS analyses. All particles were mounted as a monolayer on a 25 mm OD Ted Pella, Inc., PELCO® tape tab-covered aluminum SEM stub. If necessary to improve particle conductivity, the samples were carbon or gold coated prior to SEM/EDS analysis. SEM/EDS work was tested commercially at Microvision Laboratories of Chelmsford, MA, using a Bruker® X-Flash® Peltier-cooled silicon drift detector (SDD). The electron beam current was 0.60 nAmperes, accelerated at a voltage of < 0.5 to 60 keV. Want to look at the numbers? Click below to download the complete data sheet of our samples (.xlsx). Boat tracks and other clutter have been removed from this graphic. (Above) Browse the location, supplementary info and photographs of samples taken in Japan with our interactive sample map created by Ben Shulman-Reed, Fairewinds Energy Education program researcher. Tokyo vehicle air filter image (Left) and 7 day exposure autoradiograph (Right) Corresponding auto exposed points on the X-ray film are connected by red lines. SEM image of hot particle, magnification 5000 X. (Top) SEM/EDS spectrum showing one nodule of hot particle with 15.6% Cs, 16.7% Te, 1.2% Rb, 0.61% Po. (Bottom) second nodule with 48% Te, 1.2% Po, 0.18% Dy (analyzed 12/18/2013). Increases in perinatal mortality in prefectures contaminated by the Fukushima nuclear power plant accident in Japan: A spatially stratified longitudinal study. Descriptive observational studies showed upward jumps in secular European perinatal mortality trends after Chernobyl. The question arises whether the Fukushima nuclear power plant accident entailed similar phenomena in Japan. For 47 prefectures representing 15.2 million births from 2001 to 2014, the Japanese government provides monthly statistics on 69,171 cases of perinatal death of the fetus or the newborn after 22 weeks of pregnancy to 7 days after birth. Employing change-point methodology for detecting alterations in longitudinal data, we analyzed time trends in perinatal mortality in the Japanese prefectures stratified by exposure to estimate and test potential increases in perinatal death proportions after Fukushima possibly associated with the earthquake, the tsunami, or the estimated radiation exposure. Areas with moderate to high levels of radiation were compared with less exposed and unaffected areas, as were highly contaminated areas hit versus untroubled by the earthquake and the tsunami. Ten months after the earthquake and tsunami and the subsequent nuclear accident, perinatal mortality in 6 severely contaminated prefectures jumped up from January 2012 onward: jump odds ratio 1.156; 95% confidence interval (1.061, 1.259), P-value 0.0009. There were slight increases in areas with moderate levels of contamination and no increases in the rest of Japan. In severely contaminated areas, the increases of perinatal mortality 10 months after Fukushima were essentially independent of the numbers of dead and missing due to the earthquake and the tsunami. Perinatal mortality in areas contaminated with radioactive substances started to increase 10 months after the nuclear accident relative to the prevailing and stable secular downward trend. These results are consistent with findings in Europe after Chernobyl. Since observational studies as the one presented here may suggest but cannot prove causality because of unknown and uncontrolled factors or confounders, intensified research in various scientific disciplines is urgently needed to better qualify and quantify the association of natural and artificial environmental radiation with detrimental genetic health effects at the population level. 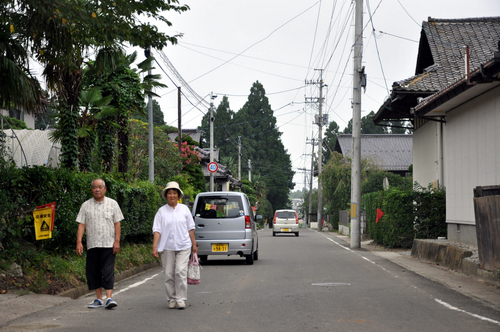 People walk along a street in the Miyagi Prefecture town of Yamamoto, where planned decontamination of homes has not yet been carried out. Some residents do not even know that decontamination work is scheduled. More than half of the 74 municipalities in the Tohoku and Kanto regions that have planned decontamination of residences in areas where surveys of radioactive pollution are needed have yet to complete the work, a survey by the Mainichi Shimbun has found. The survey showed that as of the end of June, 40 cities, towns and villages had yet to complete planned decontamination of homes, with at least 311,700 still needing work. In two municipalities — the Miyagi Prefecture town of Yamamoto and the Fukushima Prefecture town of Shinchi — residential decontamination had not begun at all. Altogether, 104 municipalities in the eight prefectures of Iwate, Miyagi, Fukushima, Ibaraki, Tochigi, Gunma, Saitama and Chiba have been designated by the environment minister as areas where surveys of radioactive pollution are needed. The Mainichi Shimbun questioned all of these municipalities on the progress of decontamination of houses, roads, farmland and forests, and received replies from all of them. The survey did not cover schools and other public facilities, where decontamination work has mostly been completed. Of the 104 municipalities, 74 have made plans to decontaminate residents’ homes. Twenty-nine of those that have not yet completed this work are located in Fukushima Prefecture, which has a large number of houses subject to decontamination. At least 286,002 homes in these 29 municipalities still need to be decontaminated. Another four municipalities are located in Tochigi Prefecture, four more in Miyagi Prefecture, two in Ibaraki Prefecture and one in Gunma Prefecture. In these four prefectures, 25,719 residences remain to be cleaned. When asked how many homes would be decontaminated in the future, three municipalities did not reply. One of them explained that data was still being compiled. The Miyagi Prefecture town of Yamamoto has planned decontamination of 1,495 homes, while the town of Shinchi in Fukushima Prefecture has planned to decontaminate 600 homes, but the work has yet to commence in either of the municipalities. When questioned why work was not progressing, many municipalities cited a lack of temporary storage areas for radioactive waste. “We are having extreme difficulty securing places to temporarily store contaminated soil,” a representative of the Fukushima Prefecture city of Iwaki said. The Tochigi Prefecture town of Nasu, meanwhile, stated that the process of gaining consent from the vast number of people involved in properties was taking a long time. Other municipalities reported similar difficulties in gaining consent from landowners. In addition, five municipalities in Iwate, Ibaraki and Fukushima prefectures said that they had finished decontamination at all of the planned locations, but that there was a need for additional decontamination in spots where relatively high levels of radiation were detected, such as under the eaves of homes. A total of 70 municipalities had planned to decontaminate roads, but 41 of them had yet to finish the work. In addition, 28 out of 47 municipalities had yet to complete decontaminating farmland, and 36 out of 44 had yet to decontaminate forests.